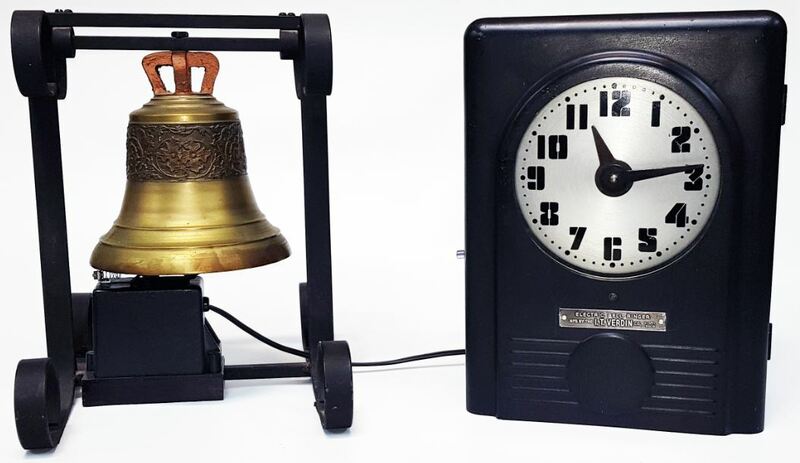 The common Montgomery clock was an industrial mechanical clock/timer used in a variety of applications including school bells, church bells, chimes, carillons, factory whistles, etc. These clocks employed an AC synchronous motor that drove the mechanisms to keep the time. In the USA, its accuracy was based on the 60 Hz AC electric mains line sent from the electricity utility company. Generators at the power plant were required to be synchronized to a set standard and at the end of the day, the utility company was required to turn in a count to the governing agency. If throughout a day the AC was either a bit slow or fast, the operators had to adjust the speed of the generators to compensate for the loss or gain thereby meeting the required count of 5,184,000 cycles per day. The main object was to not gain or lose cycles during a week. If they fell short on one day, they had to make it up on the next. Today most clocks are equipped with internal quartz oscillators and do not rely on the AC mains for timing. Therefore, the electric generation plant may not be held to the same standard of accuracy as was the case during the 1930s through to Y2K. 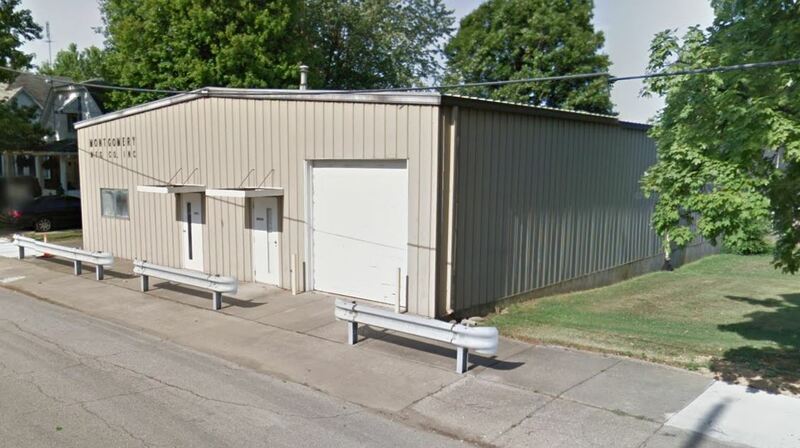 Ok, before you get all excited or start wondering, the facility that manufactured clocks in Owensville burned down sometime in the mid-1970s taking out the manufacturing plant as well as the parts warehouse. This effectively ended the industrial use and repair of Montgomery clocks. I worked one summer break from college for my grandfather’s company which was called the I. T. Verdin Company, a custom builder of church, school, and municipal bell towers, bell ringers and electronic chimes. When I worked there, they mainly used Montgomery clocks in their bell ringer controllers and chime systems. Over the years, I did acquire a number of these clocks, two of which I still have. One of them, the 1950s clock has been running off and on for over 40 years. 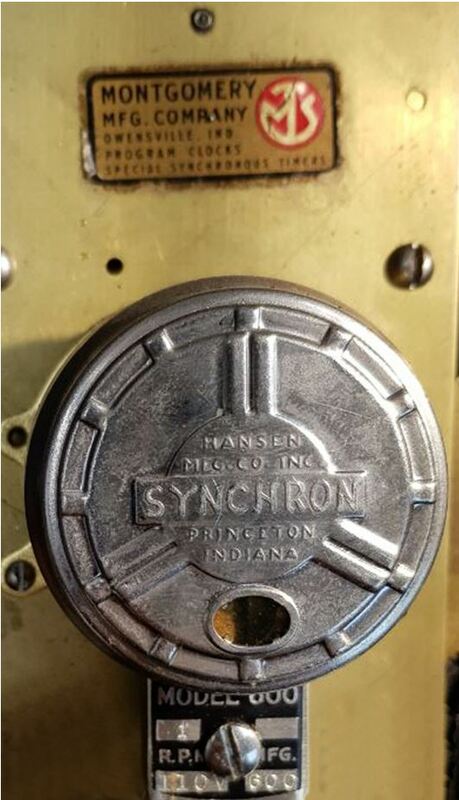 During that time I used it for a variety of applications ranging from a furnace setback thermostat, my alarm clock, a timer to turn on and off exterior lights, and now in my library as a shelf-top clock to ring on the hour – a single strike of a small bronze bell. Its AC motor does rely on the mains (line frequency) for its accuracy. According to an atomic radio-controlled quartz clock on my desk, the utility company does still seem to send the correct number of cycles per day. 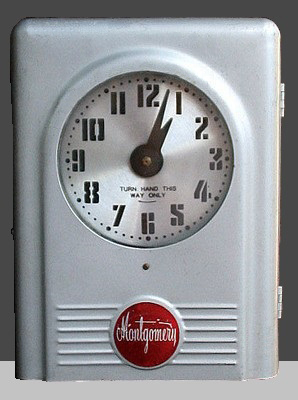 My Montgomery clock is very reliable and is built of parts that were way over engineered for durability and reliability. 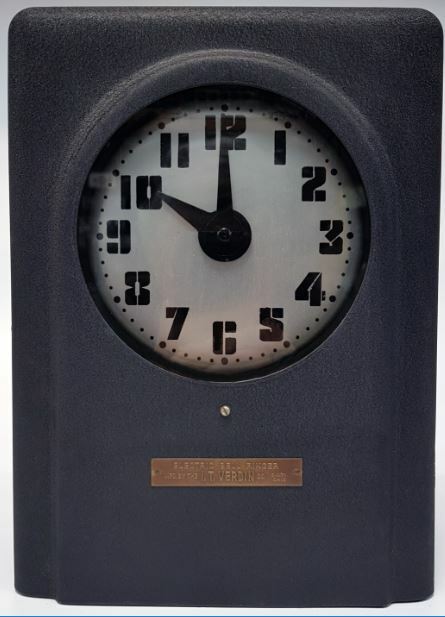 Montgomery clocks came in a variety of – well number of circuits. By that I mean, these clocks momentarily close or open a set of contacts in three micro switches at programmed preset times. Each of these sets of three switches are called circuits. There are three sets of contacts to complete one circuit. 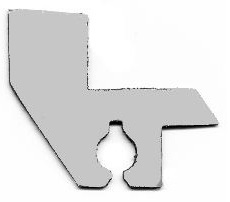 The first micro switch is the day or half day switch. If on that day/morning or afternoon, depending upon the clock model, there is a tab inserted into a slot in the day wheel for that day or half-day, the trip arm is pushed out and its micro switch is activated. Depending upon the model, the day wheel can optionally accommodate 7 tabs (1 for each day) or 14 (1 for each AM and PM of each day). The day wheel is advanced by a special larger tab that is off center and is inserted into the outer rim at a time during the day or night when there is no activity. 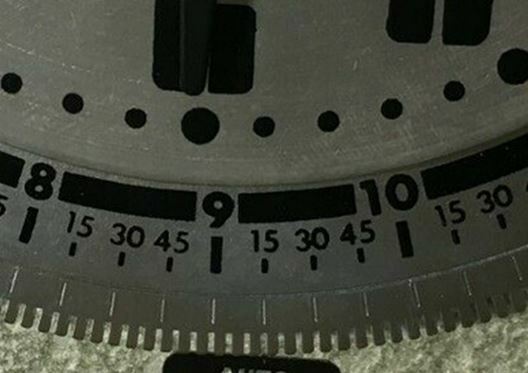 Because the day wheel is at a different position on the rim than the marked noon/midnight time, its special trip tab is usually inserted on the rim at a mark 3 to 3½ hours before noon and or midnight. There are two tabs inserted for Noon and Midnight for AM-PM half-day wheels and one tab for Midnight for day only wheels. Most Montgomery clocks have a resolution or interval of 5 minutes, meaning the clock can only be programmed for a 5-minute mark. A small tab is inserted into one of the desired 5 minute slots on the outer rim. There are 288 slots with 144 for each AM and PM. There are 12 slots per hour. Since the clock face only has 12 hours, the rim moves at half the number of revolutions of the hour hand. The second micro switch points to the time of day. If there is a tab inserted in at a particular time slot, the trip arm will have been slowly pushed all the way down and the micro switch will then be activated. The third is the five minute mark trip switch. This switch is activated on every 5 minute mark regardless of the state of the other two switches in the circuit. This is done by a rotating flat disk with a notch in it. 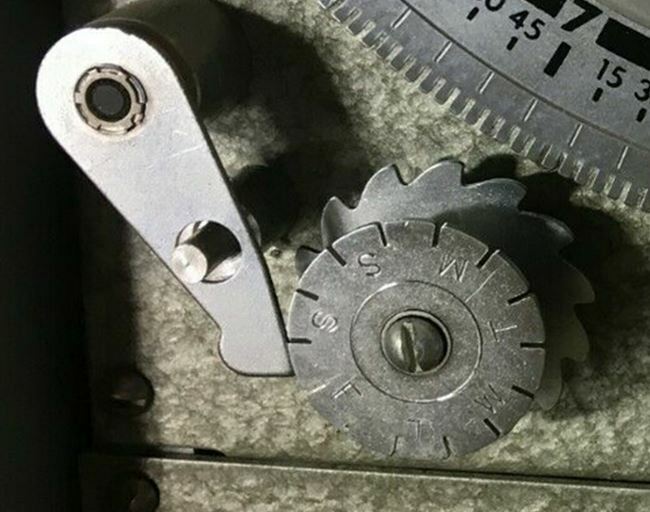 This is inside the clock within the clock movement. When the notch comes around to the trip arm, the arm will snap into the notch on the 5 minute mark activating its micro-switch. When all three switches complete a circuit, then a relay, a directly connected device like a bell or a motor start relay will be tripped. Basically, it is as if a momentary button was pressed. In fact, a lot of Montgomery clocks had test buttons installed to simulate tripping event. If something was to be turned on and later turned off, a latching relay was often used. These clocks could basically be ordered such that they were configurable by the user. Based upon a client’s specifications and depending upon the complexity of a controller, the Verdin Company would use clocks that could have over ten separate circuit rims, day wheels and switch sets. 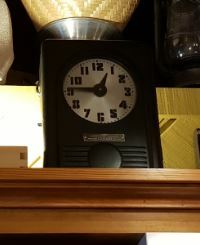 Since one of my clocks is a two circuit clock, it meant that when I used it as an alarm clock, I could set the clock to wake me at 6:00am on week days and at 8:00am on weekends. I had a holiday/vacation switch that overrode the weekday program and switch it to the weekend program. I just had to remember to return the switch back to its normal mode. When I used the clock as a setback thermostat controller, the weekday/weekend program also did pretty much the same thing except without the holiday switch. Today, the weekday/weekend settings determine when to allow the bell to start and stop ringing so it doesn’t ring at night. On the above clock, I configured the day and 5-minute switch to turn on a small 24 volt DC power supply a minute or so before the hour strike which in-turn charged a large capacitor. 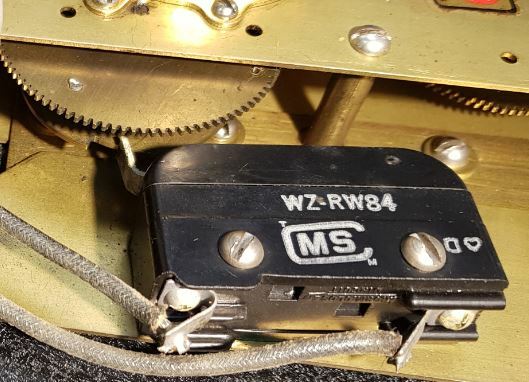 Then the internal five minute mark trip wheel would come around and close the contacts to the bell strike solenoid sounding the bell and discharging the capacitor. Then several seconds later, the power supply shuts off when the tab goes past the 5-minute trip arm. The bell strike is pleasing but not over powering. It’s about as loud as hitting high F on a piano – except it has a number of wonderful sub-harmonics indigenous to bells. Note. Sometime about 40 years ago, I painted over the scratched up gray Hammerite finished that was originally on the clock. 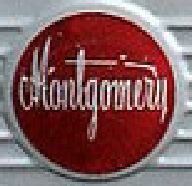 It did not have the Montgomery label silk screened on it. Instead, it just had the Verdin badge. The Verdin Company as it is called today still has tens of thousands of installations around the world that use these Montgomery clocks. However, they no longer build controllers with mechanical clocks and old style relays. Verdin bell ringer controllers and electronic carillons are touch-screen digital computerized technology with a number of models being iPad sized terminals that sit atop a desk.